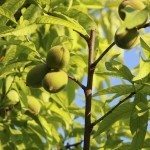 My peach tree has a good amount of peaches, but the leaves are quite small and yellowing. I fertilize organically and mulch with horse and kitchen scrap compost and water regularly. What could be the problem? Looks like your tree is not receiving enough water. I would water every other day, especially during dry spells. Make sure the water is wetting soil down to 18 to 24 inches depth. Mulch with 3 to 4 inches of hardwood mulch to help with moisture levels. Keep the mulch away from the base of the tree to avoid disease.